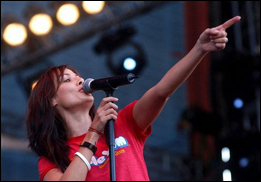 LOS ANGELES (VIP-NEWS) — Natalie Imbruglia has signed with ICM Partners’ concerts department. The pop singer’s debut album, 1997’s Left of the Middle, sold seven million copies worldwide and featured the single “Torn,” which hit No. 1 on multiple charts around the world, including the U.S. Billboard Top 40, and was certified platinum in the U.K. and her native Australia. In March 2015, Imbruglia will release her fifth studio album, a covers album via Sony Masterworks, featuring male artists including Neil Young and Daft Punk. Imbruglia, who began her entertainment career as a regular on the Australian soap opera Neighbours, made her stage debut this past spring at England`s Theatre Royal Bath in playwright Alan Ayckbourn`s Things We Do For Love. As a philanthropist, she is heavily involved in women’s health issues and will being shooting a documentary about the subject in Ethiopia later this year. She is managed by Benchmark Entertainment and DSW Entertainment.